Posted on March 1, 2019 by William A. 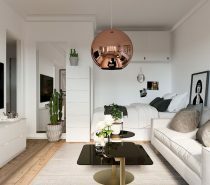 Small-scale meets upscale In these two stylish city apartments. 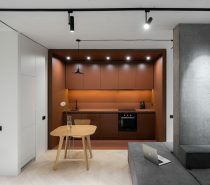 The main thing that these compact apartments have in common is that they are both family homes, and so must function as such. 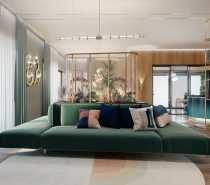 Each home features a neat open plan living room, which squeezes a lounge, kitchen and functional dining area into close quarters. As well as the master bedroom, there is a kids room to consider, so that everyone has their own private retreat of course. There is also an extra powder room to help facilitate typical family life during busy morning routines. 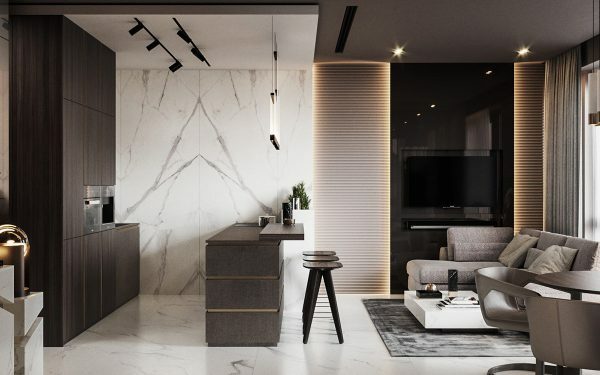 Take note of some savvy layouts, and cool decor schemes that look grand beyond their scale. 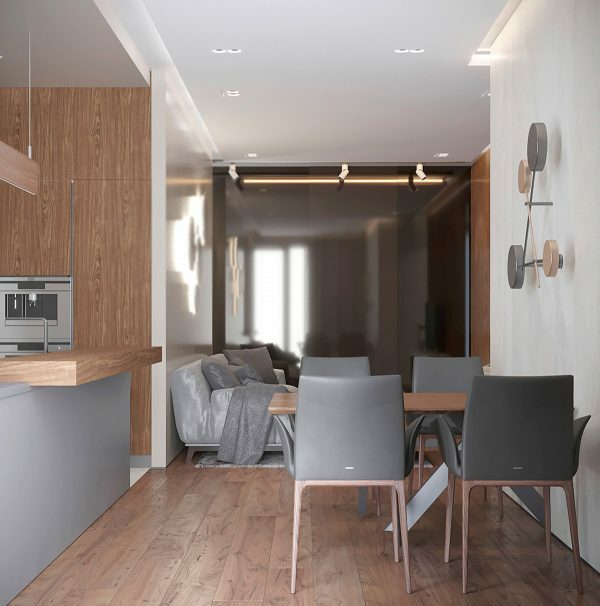 Our first small apartment interior was designed for a young family in Dnipro, Ukraine. 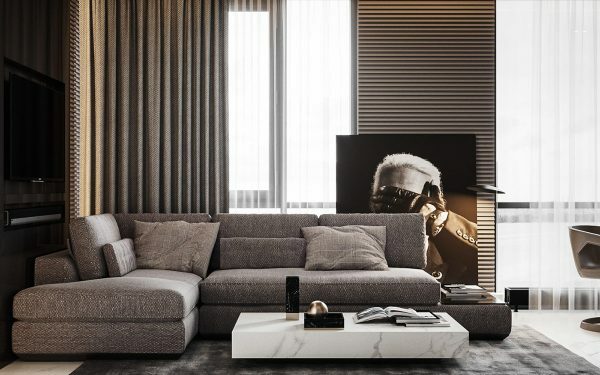 Practical shades of grey and hard wearing textures define the family living room. 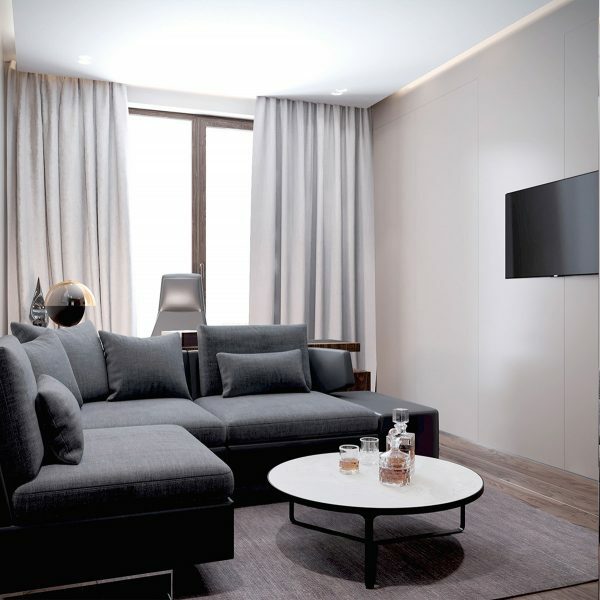 In front of a grey fabric sofa stands a white marble modern coffee table. 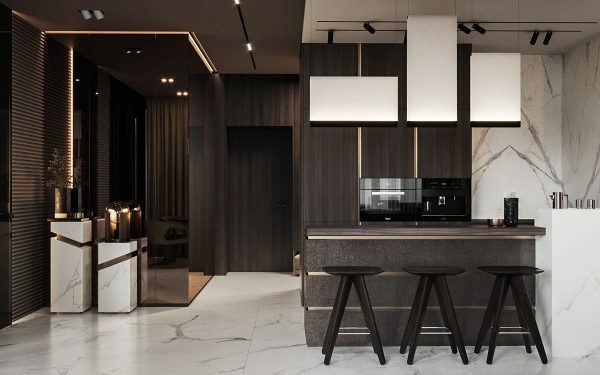 The luxury material sets an upscale theme. 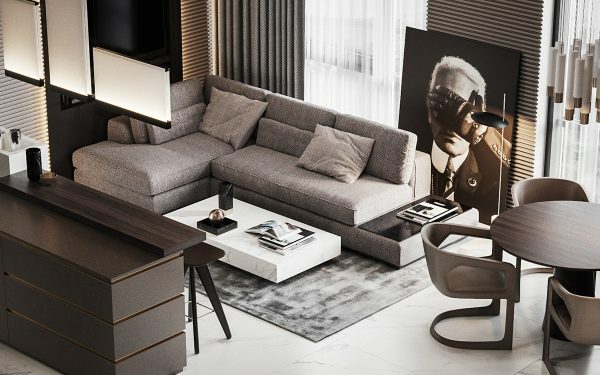 The sofa design incorporates a side table into its base, with a black glass surface; the unusual and sleek extension screams high-end. 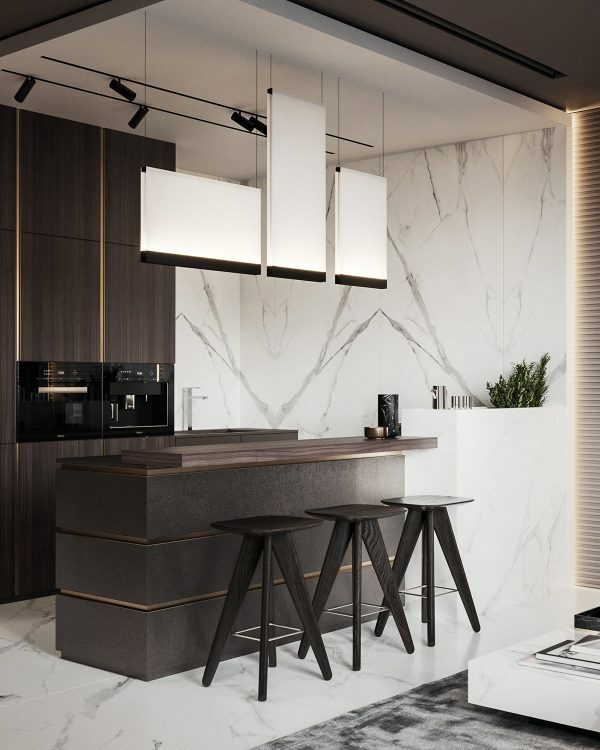 At the end of the kitchen run there is a feature wall of bookmatched marble, which is an extravagant yet easy wipe-clean selection. 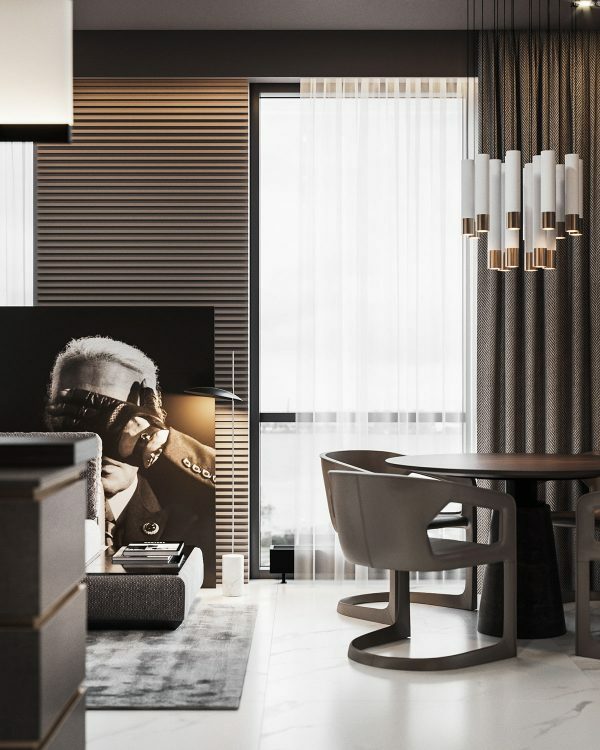 Adjacent panels in the lounge area are of a ribbed design, which is accentuated by soft lighting. 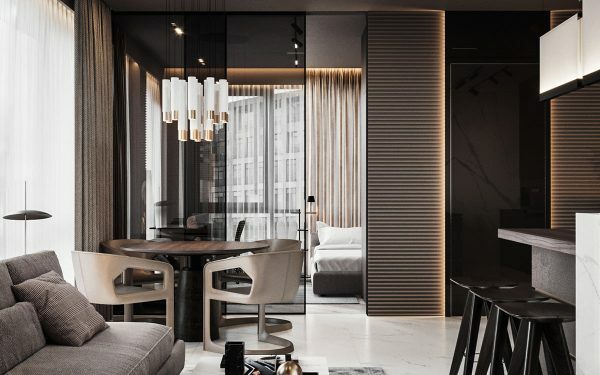 Smoked glass doors divide the kids bedroom from the living room dining room combo. 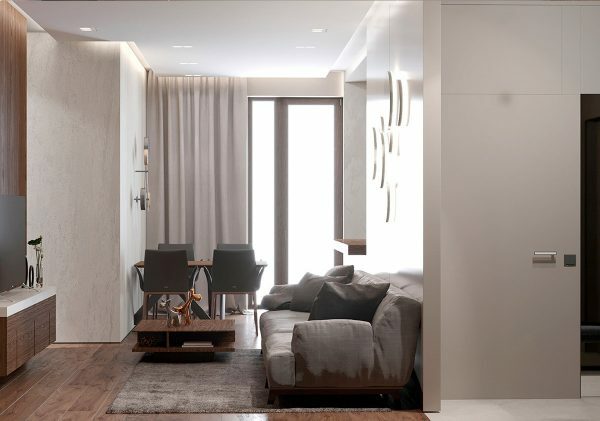 Installing tinted glass doors rather than an opaque design makes the living space feel larger, as the doors allow a glimpse through into the next space. 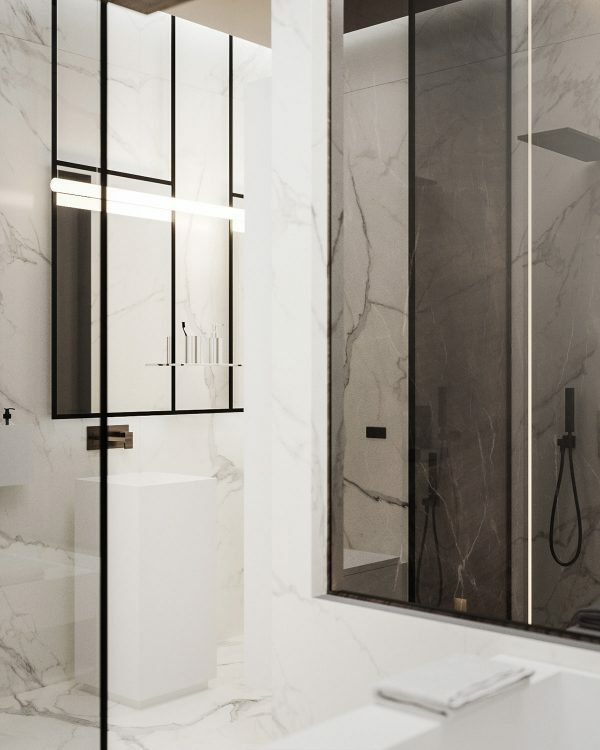 The glass also reflects the light, resulting in a highly polished look. Adjoining the kids room to the main living space results in a more generous area for play, as the child can move freely between the two. A designer pendant light dangles above the round dining table, with is encircled by curvy modern chairs. 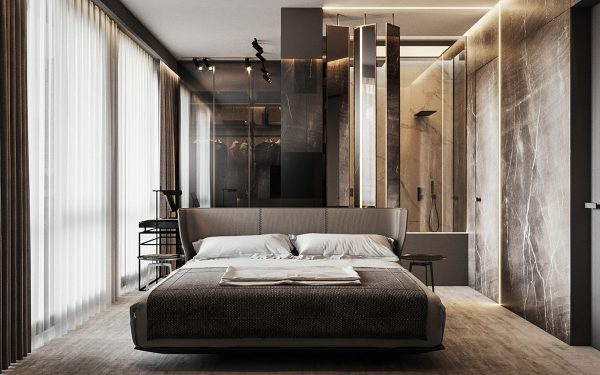 Inside the master bedroom, a dressing area has been fashioned behind the headboard. The vanity table nestles beside black reflective closets. 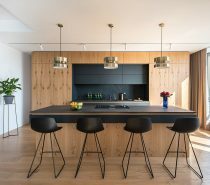 Three kitchen bar stools line up along the kitchen peninsula so that family members can chat whilst dinner is being prepared. Metallic trims brighten dark kitchen cabinets. Two luxe white marble plinths are cut through with gold. 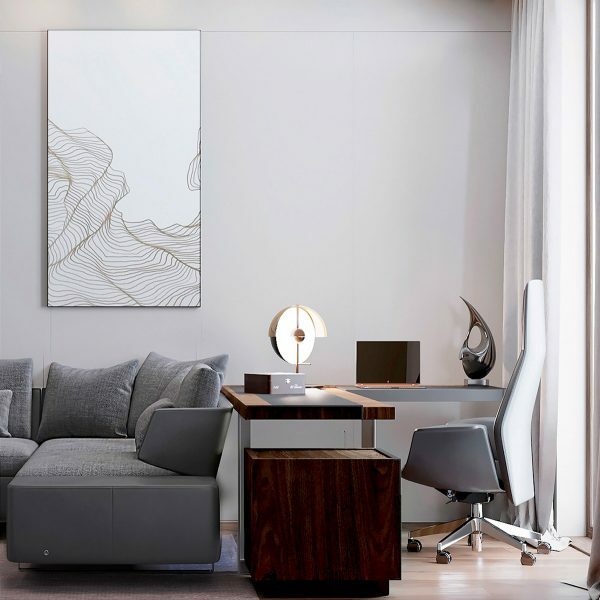 A decorative vase and a designer table lamp adorn their surfaces. An unusual trio of lights illuminate the breakfast bar at the galley kitchen. 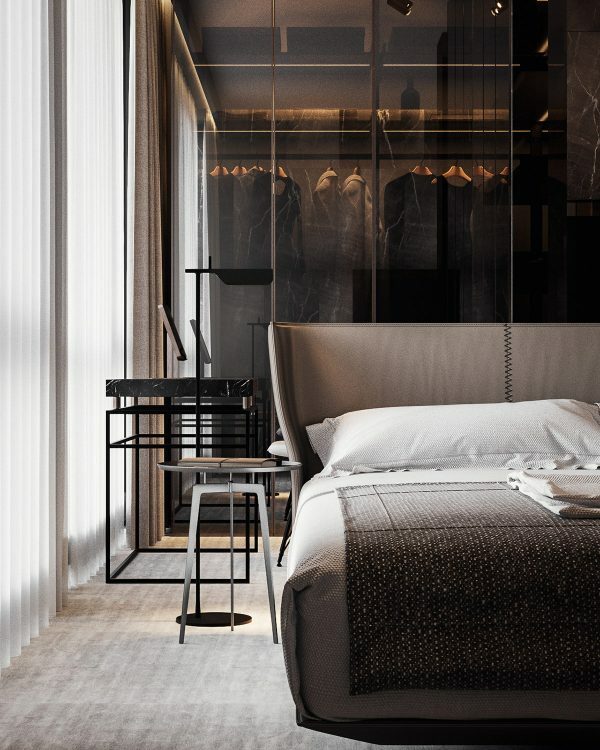 The master bedroom is divided by the winged headboard of the platform bed; the dressing area is found to the left of it, with access to an ensuite bathroom on the right. 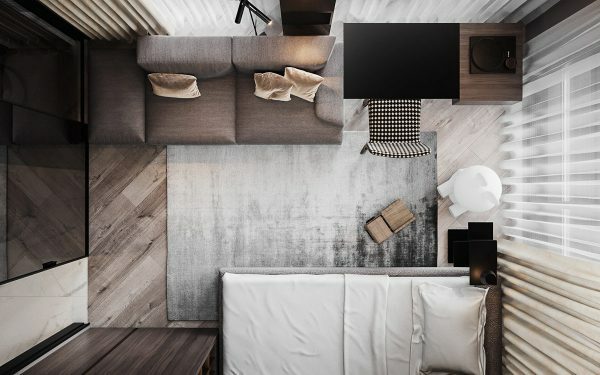 A small side table and floor lamp serve the bed. 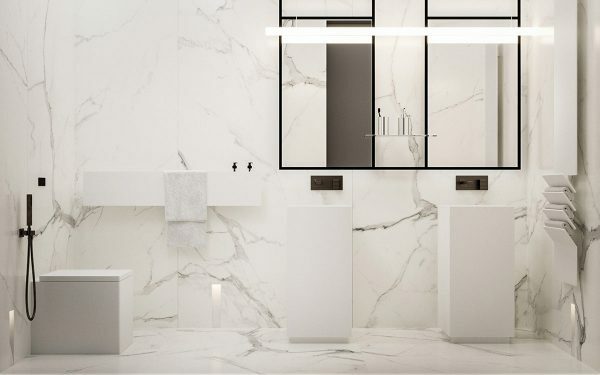 The master bathroom is a vision of white marble from top to toe. 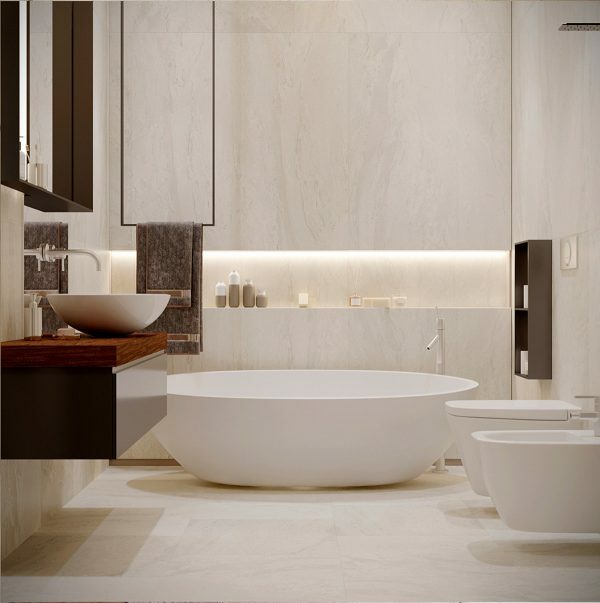 The toilet, bathtub and pedestal basins have a sharp cuboid outline. 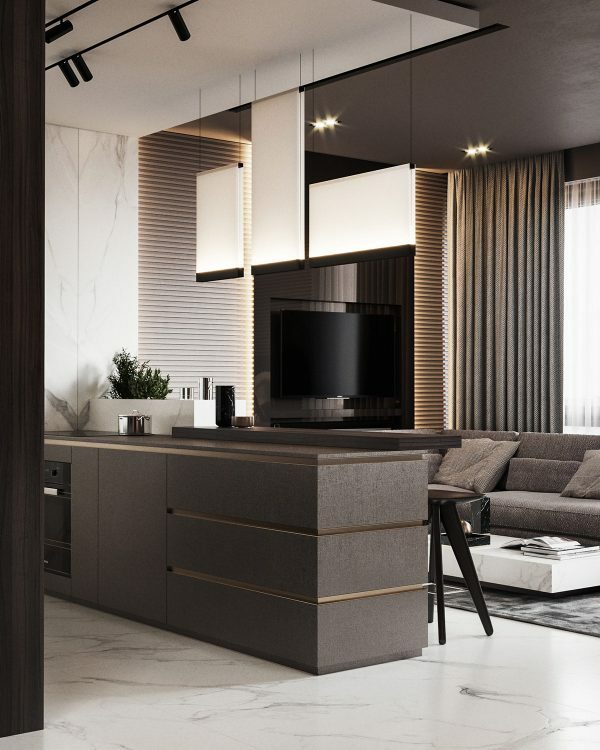 Neutral colours make up the kids decor in this home too. 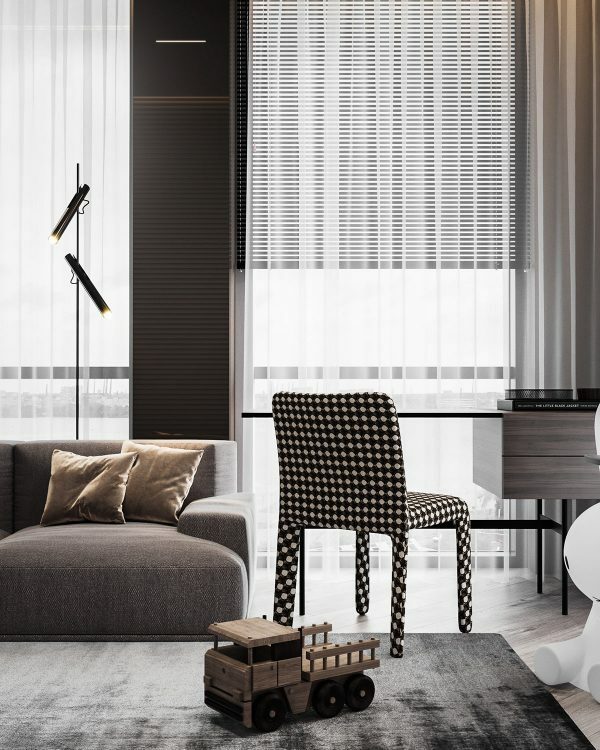 Zany yet fittingly monochrome pattern makes the desk chair the standout piece in the room. Bespoke bookshelves are a good use of narrow wall space by the door. 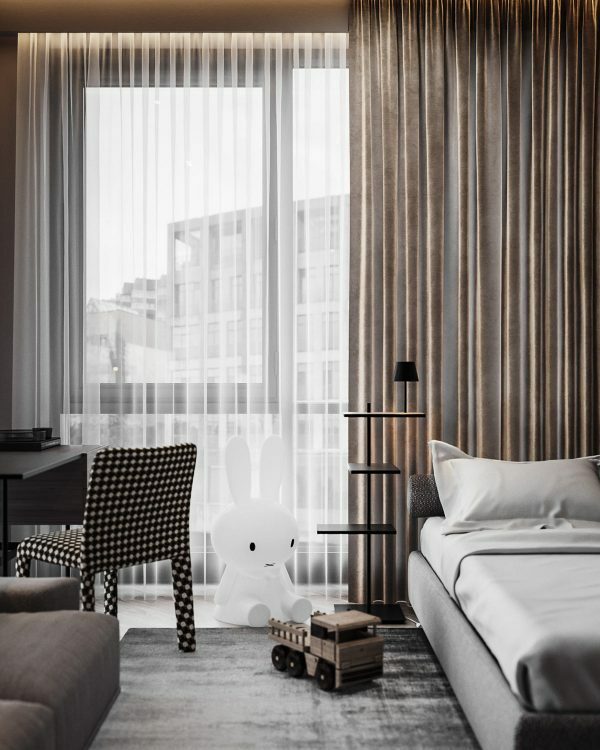 The popular large Miffy lamp sits by an unusual bedside unit with an integrated mini lamp. 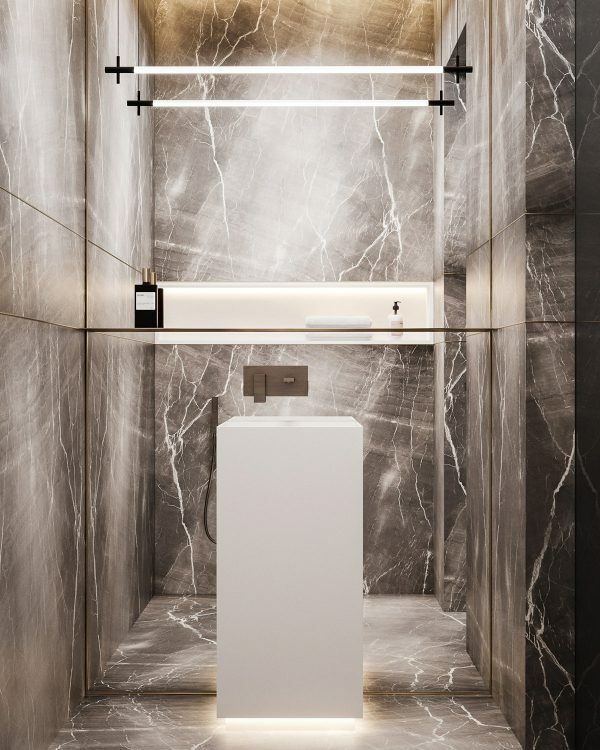 A unique bathroom sink graces a powder room that’s clad in streaked marble tile. Apartment number two takes a more minimalist approach to the family living room. 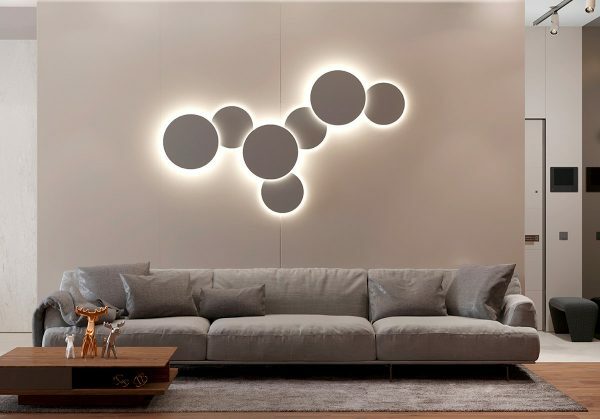 A long grey sofa gives family members plenty of room to sit together beneath sculptural wall lighting. A low wood coffee table holds a quirky animal sculpture set. 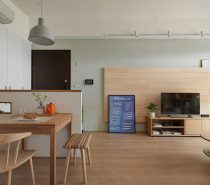 A modern media cabinet is mounted onto a wood tv wall opposite the sofa. 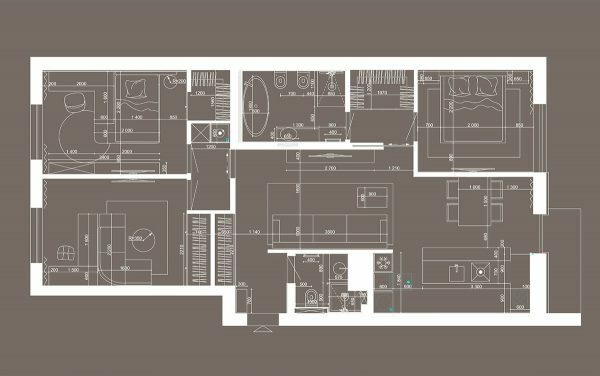 The living room follows an L-shaped floor plan, with the next space off the lounge dedicated to the dining area. 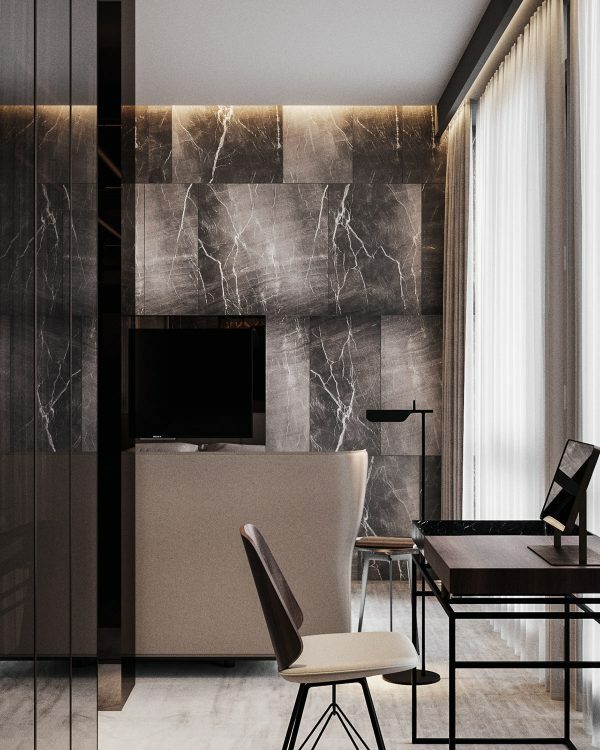 The grey and woodgrain decor theme continues throughout. 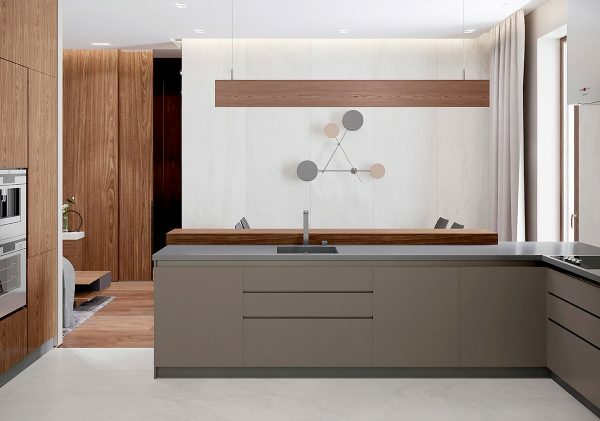 A wooden bar light hangs above the grey L-shaped kitchen arrangement. 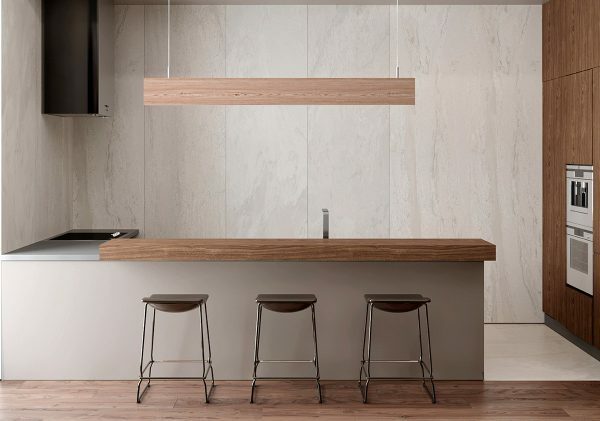 Tall wooden cabinets have been recessed into the walls on the other side of the room. Three kitchen bar stools pull up at a wooden breakfast bar along the grey kitchen peninsula. This can be used for casual family dining, or as a homework setting next to a parent cooking dinner. 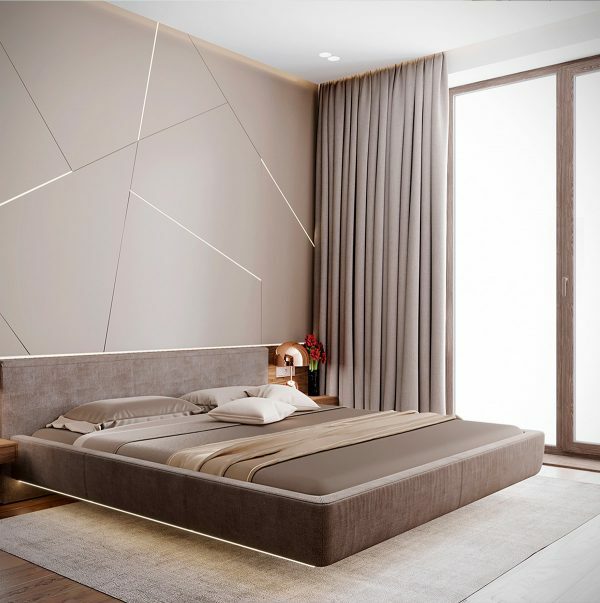 In the master bedroom, a beautifully minimalist platform bed appears to float away from the headboard. 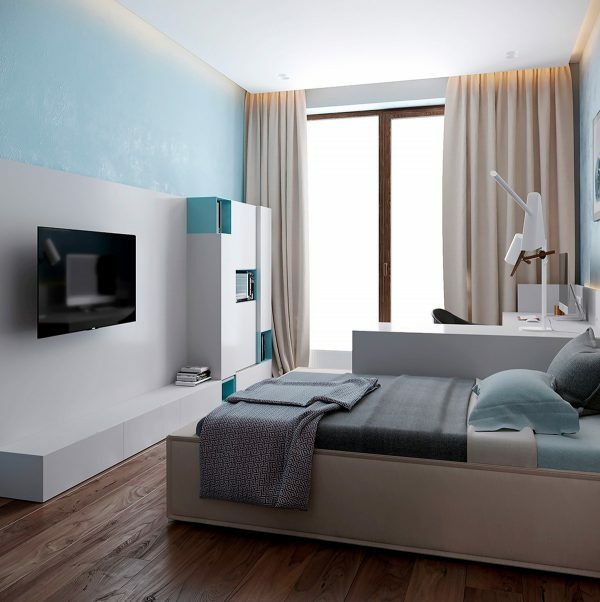 Floating bedside drawers have been incorporated too, and a copper desk lamp adorns each one. This is the Tom Dixon Bell lamp. 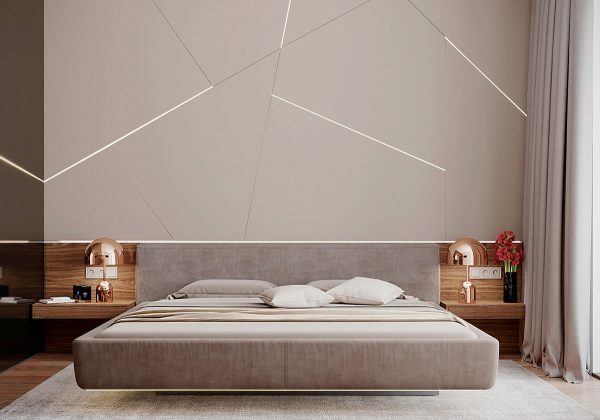 The bedroom lighting scheme includes strip lighting along the headboard and bed base. 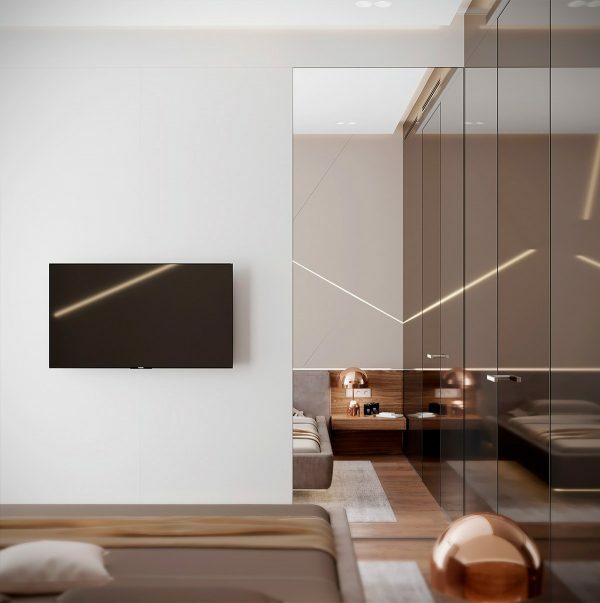 A futuristic feature wall includes LED strips too, which accentuate geometric cut panels. 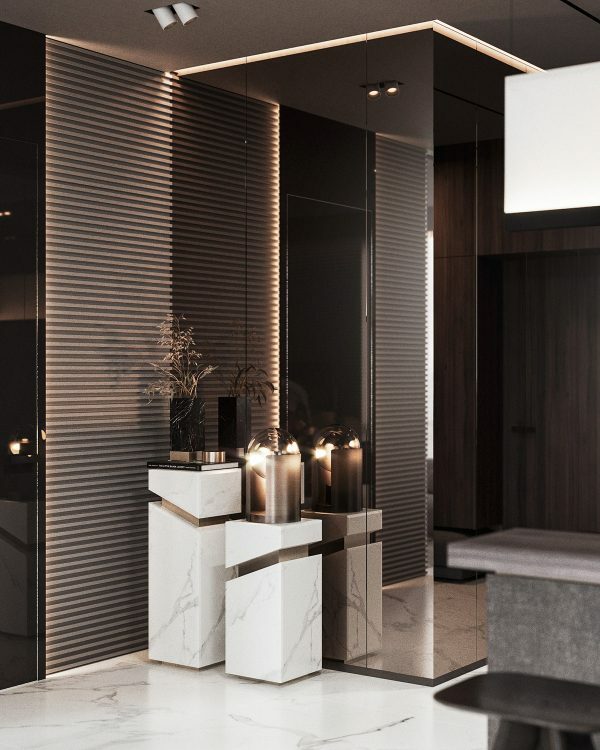 Mirrored closet doors reflect the lighting features and enlarge the feel of the room. 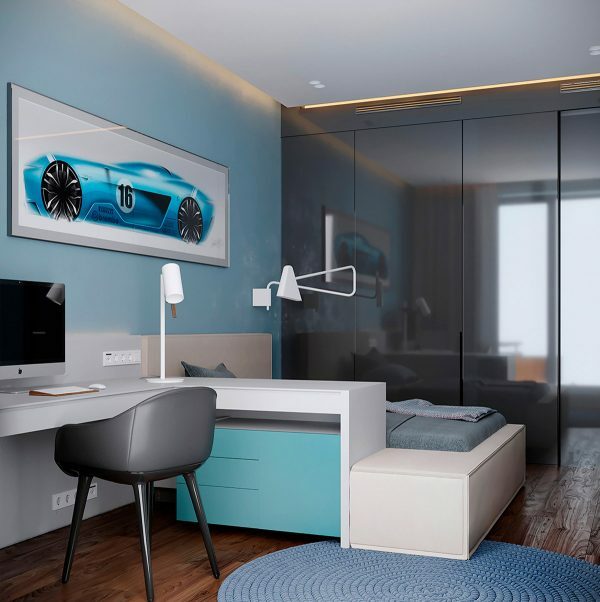 The family apartment includes a dedicated modern home office, so that a parent can get away and get some work done – or just… get away! 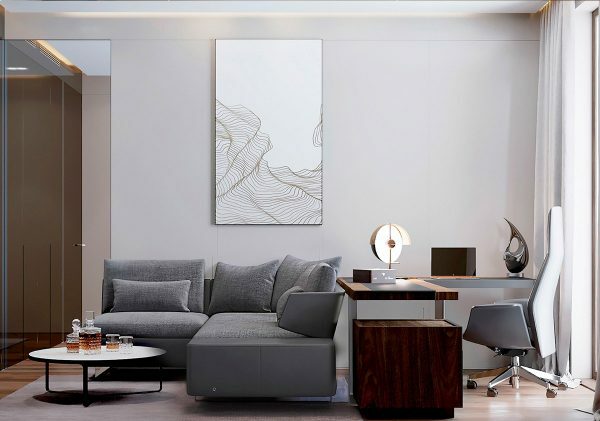 An L-shaped sofa and L-shaped desk stand against each other to divide the room between work and relaxation. Crystal decanters occupy a coffee table in the study. 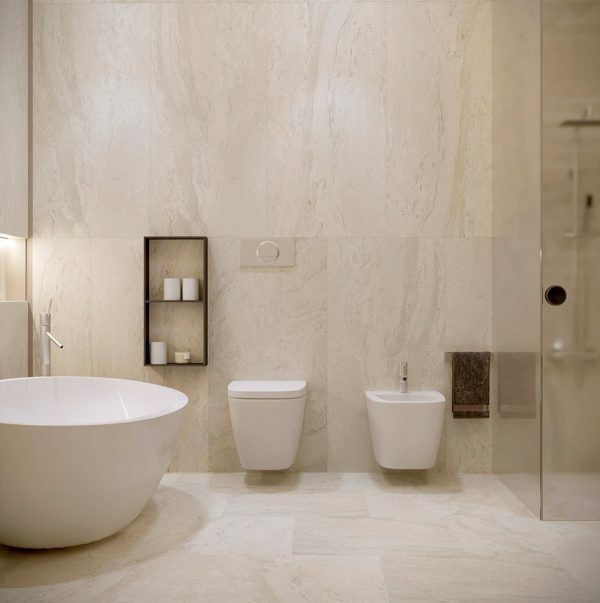 The master bathroom decor combines a soft white backdrop with rich wood effect pieces. 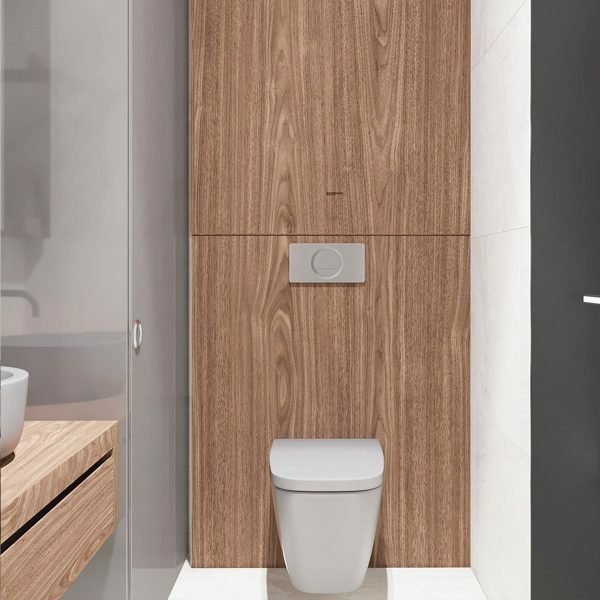 A wall hung toilet and bidet set keep the floor looking clean and spacious. 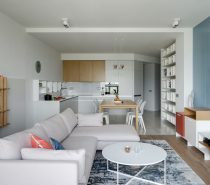 The kid’s decor in this apartment comes in complete contrast to the rest of the home, with an individual blue colour scheme. 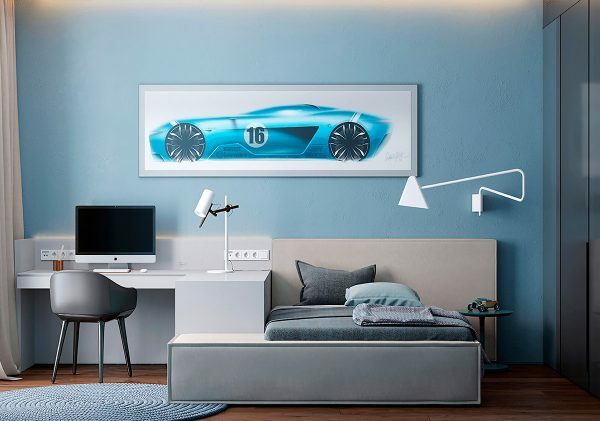 The kid’s furniture is a bespoke design where the bed and desk are one connected piece. 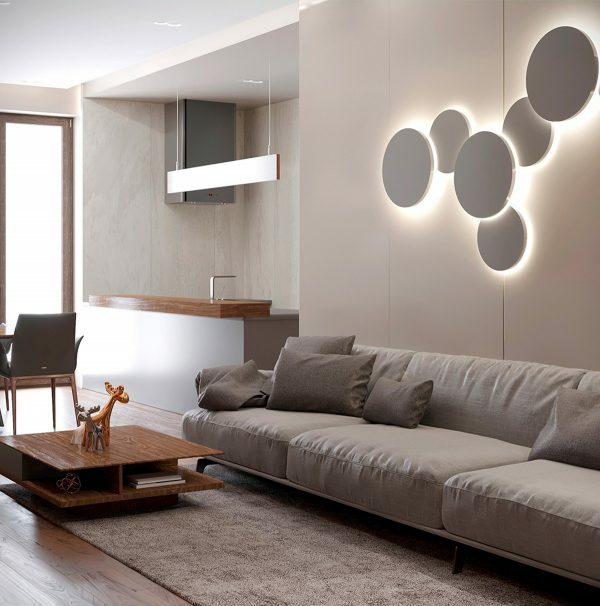 A geometric style swing arm swing arm wall lamp provides reading light over the unusual bed. 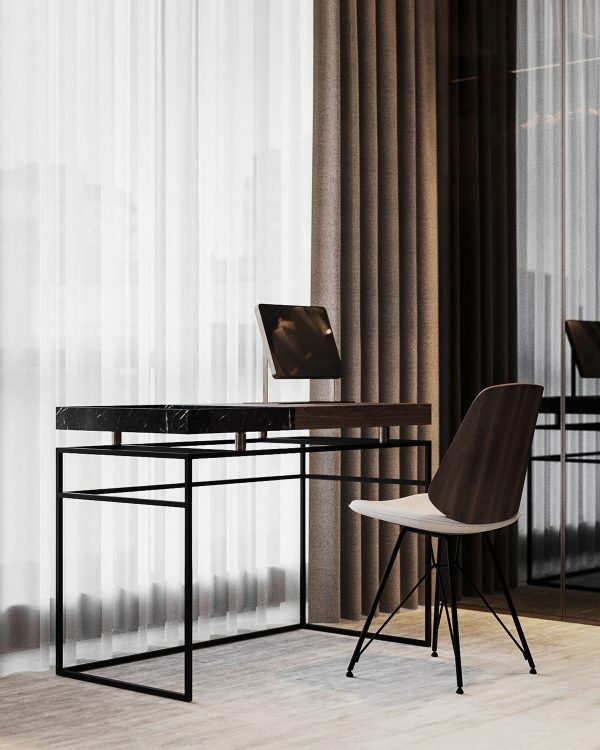 A Scantling table lamp serves the desk. 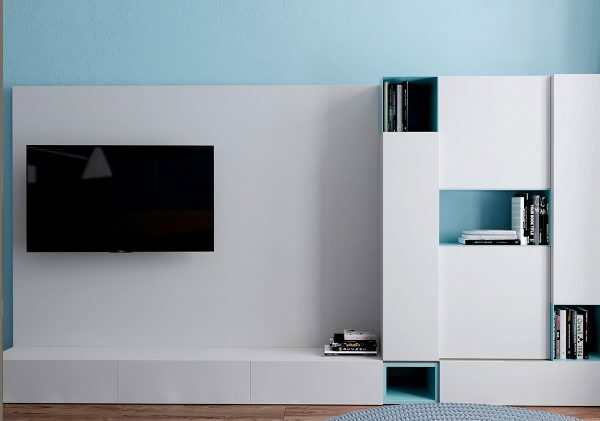 A tv wall panel with media unit is combined with tall storage cabinets and bookshelves. The book cubbies have been picked out in bright blue to match the walls of the room. Wood panelling warms the look of a second white bathroom.